Hi everyone. My Python Jumpstart by Building 10 Apps course has been out for awhile now. I’ve already started on the next one which I’m calling Python for Entrepreneurs. I’ll keep you posted as that develops. Today I wanted to tell you about a few features I’ve added to the player and the platform that have been requested by many of you. You can see from the screenshot above that the player has automatically recorded which videos I’ve watched across all my devices (grey with checkboxes). You can see I’ve added a significant amount of quick access, navigational, and transcript / subtitle features in the player. Use the CC icon in the lower-right to enable subtitles (and the HD allows you to adjust the quality / size while you’re there). Note that on Chrome sometimes it forgets your settings to keep this selected. I believe this is a third-party cookie setting. 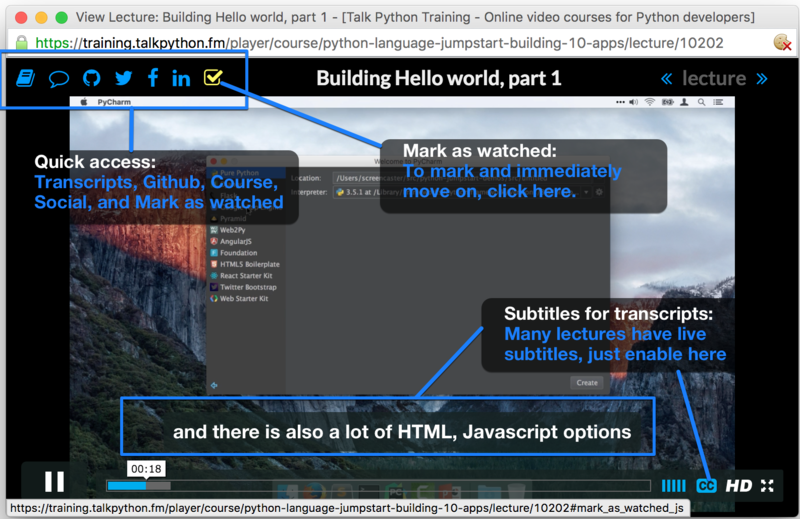 Top has, from left to right, access to the main course page, transcript popup, github repository, twitter, facebook, linkedin shares, and “mark as watched and go to next”. The mark as watched is automatic, but this allows you to skip ahead and record the video was watched even if you don’t actually watch it. 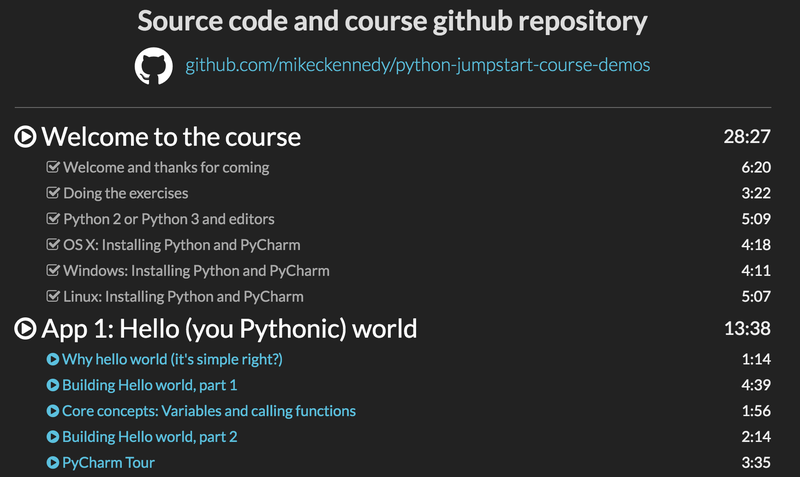 I decided to add the transcript text files to the course github repository. You can have access to them offline from here and even use the “search this repository” for full text search across lectures. Note that I’m adding transcripts as they get finished, but only the first 6 chapters have transcripts at the time of this writing.